One reason I'm still getting up fairly early while on "vacation" is so that I can accomplish enough on my Day Jobbe to be able to have the late afternoon to myself. Yesterday, Lisa and I strolled down to the Seaside Aquarium, which we've seen for years on our past visits but never found the the time to visit. The lead attraction here is the Seal Tank. For $1/box, you can buy sliced-up fish to feed to the seals. 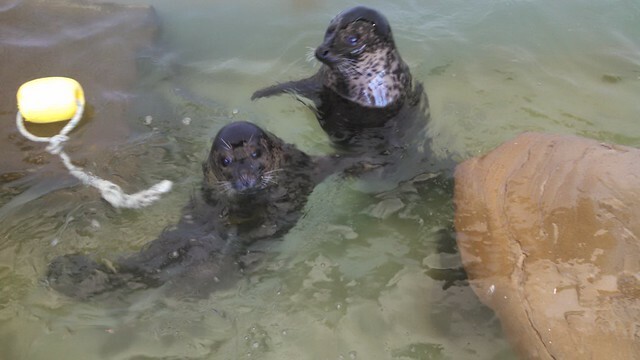 These seals were bred here, not captured from the wild, are regularly fed, and have a "back room" to which they can withdraw if they get tired of the humans. In other words, they play in the front tank and beg for fish treats because they want to do so. They appear to have developed individual strategies for getting treats. In some cases, this means splashing the feeders (us), and I did indeed get a facefull of seawater. 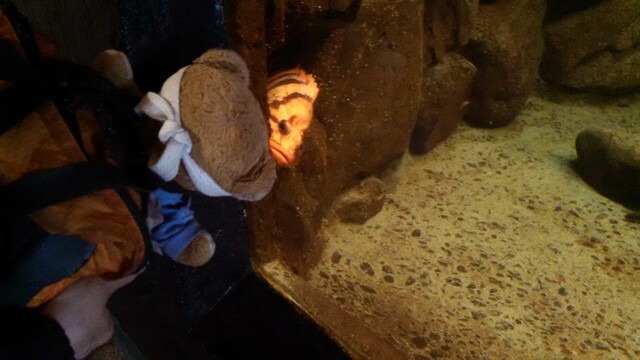 There's a "seal window" on the side of the tank, and travelswithkuma looked at the seals through it to keep from getting splashed. 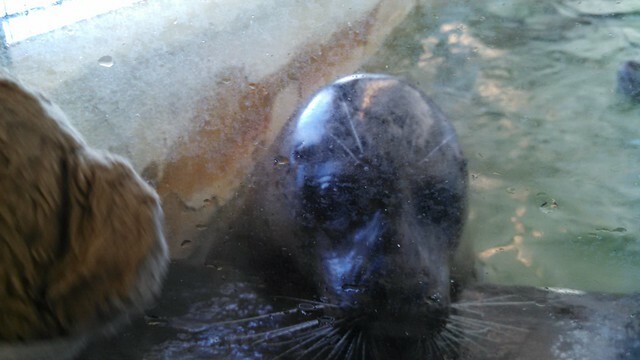 Kuma said, "Noisy seals gets all of the fishes!" 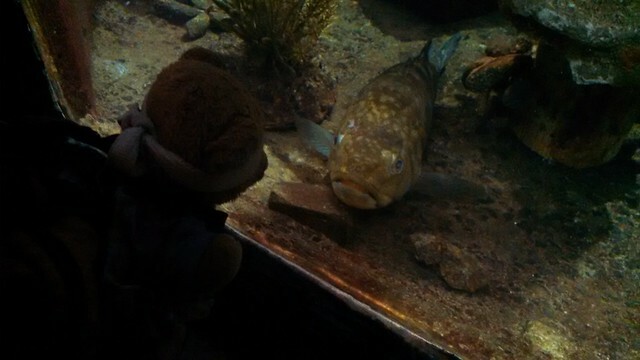 Kuma Bear looked at lots of fishes. Some of the fishes looked back at Kuma. Fortunately, there was a glass wall between them. 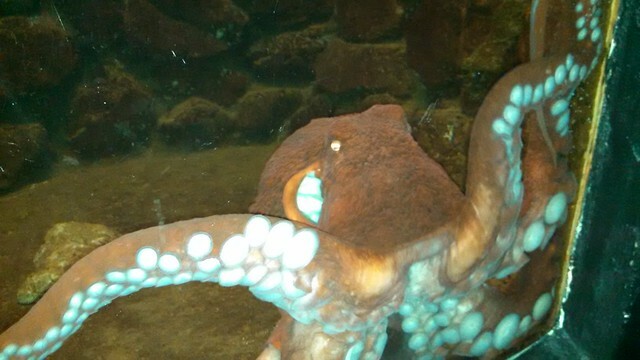 There's a good-sized octopus on display, and some smaller ones as well. Also in the aquarium is a "touch tank" where, under the watchful eye of an interpreter, you can touch sea urchins, sea stars, and other aquatic life under relatively controlled conditions. Click through any of the photos above to see the others I took. We would have stayed a bit longer, but my phone beeped to remind me of a late-afternoon conference call about which I'd forgotten. Fortunately, it gave me enough notice that we had time to swing by Zinger's Ice Cream (open Thursday-Sunday only) and walk back to the condo with plenty of time for me to set up for the call, which turned out to have been canceled anyway. The Aquarium was entertaining, and worth between one and two hours of your time, I think, if you're inclined toward such fishy exhibits. I found the seal-feeding to be fun, too. Try to come on an off-peak day as we did to avoid crowds.